Hewlett-Packard recently made a major announcement consolidating its numerous data centers and terminating 9,000 employees. This signals the anticipated shift from small data centers to utility-scale data centers. Data center facilities house thousands of servers that make up an operating system. Through the use of cloud computing, a method using internet-based IT architecture, HP has greatly reduced the amount of servers needed to operate its data centers. Therefore the company plans to reduce its present number of data centers by 50%, cutting operating costs and increasing efficiency. This shift in technology is recognized by Nicolas Carr in his bestseller The Big Switch. He makes the analogy that utility-scale computing will be a significant change for society just like the shift from steam power to utility-scale electricity. Cloud computing is a highly modernized, automated, and economical approach that is becoming increasingly popular among leading companies like Apple and Microsoft. Once the project is complete, HP’s experience can serve as a competitive advantage by integrating the lessons learned into its large consulting practice and marketing this to other data center users. Almost all organizations today rely upon data centers to store, manage, and protect all information, but this requires a great deal of power and can be very expensive. With fewer locations, HP can direct more focus to energy efficiency within these data centers. Fortunately, there are also a variety of incentives available to organizations that will reduce both energy consumption and operating costs of data management. 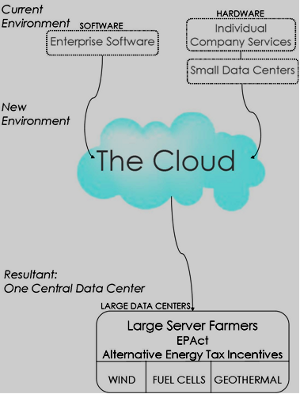 The impact of the cloud and the consolidation into tax advantage utility-scale data centers is presented in the following illustration. EPAct provides an immediate tax deduction of up to $1.80 per square foot for building investments that achieve specified energy cost reductions beyond the American Society of Heating and Air-Conditioning Engineers (ASHRAE) 90.1-2001 building energy code standards. A one-time $1.80 per square foot deduction is the maximum tax deduction, but deductions of up to 60 cents per square foot are also available for three types of building systems: lighting, including lighting controls, HVAC, and the building envelope, which includes roof, walls, windows, doors and floor/foundation. To obtain a tax deduction of 30 cents per square foot for lighting, the wattage must be reduced by 25 percent from ASHRAE 90.1-2001 levels. A maximum tax deduction of 60 cents per square foot requires a 40 percent reduction. Data centers do not require extensive lighting, yet many data centers are overilluminated. A few minor changes in the lighting design of a data center can greatly reduce costs. All existing data centers with now federally banned metal halide and T-12 lighting should upgrade to more efficient lighting. An emerging new technology, know as LED (light emitting diodes) lighting has proved to be more energy efficient than metal halide lighting. LEDs use semiconductors called diodes to provide a lower energy consumption powerful light source. They also are resistant to environmental impacts and have very long product lives. While LEDs are expensive in terms of initial cost, the maintenance cost savings is particularly crucial to fully automate data centers located in remote areas. In addition, energy-efficient LEDs typically qualify for EPAct tax deductions resulting in even greater savings. Many state and local governments have adopted plans that award expedited permits, fee reductions/waivers, and grants for LEED certified buildings. The LEED (Leadership in Energy and Environmental Design) certification developed by the US Green Building Council (USGBC) is the recognition of buildings as energy efficient, or “green” in terms of design, construction, operation and maintenance. A LEED certification program specific to data centers is currently in process, but in the mean time data centers can be certified through the “LEED for New Construction” and “LEED for Existing Buildings: Operations and Maintenance” programs. Since the LEED certification was initially intended for commercial office buildings, data centers may find difficulty in achieving LEED certification. However, the American College Testing (ACT) data center was the first in the US to earn the highest rating, LEED Platinum. This was achieved through its use of a geothermal energy cooling system. The tax advantage to a LEED data center is that it already has a building energy simulation model that can be converted into an EPAct tax model. Facebook is in the process of developing a 147,000 square foot gold LEED data center in Prineville, Oregon. This is an ideal size for maximizing EPAct tax deduction since it falls just below the more favorable less than 150,000 square foot ASHRAE HVAC reference building EPAct tax deduction category. At the $1.80 per square foot deduction, the Facebook data center could potentially qualify for a $264,600 EPAct tax deduction (see the table above). LEED certification also highlights a company in a positive public light. In 2008, Honda’s data center earned Silver certification along with good publicity and lower operating costs which was extremely beneficial during a struggling sales year. It takes almost just as much power to run the servers in a data center as it does to cool them. There are a number of steps in which cooling energy can be reduced. The first step to an efficient cooling system is to ensure sure the data center is properly sealed. This can be done by sealing all doors and windows, commonly done through the use of a vapor seal (created using a plastic film, vapor retardant paint, vinyl wall coverings and vinyl floor systems). While fans may be the most obvious way to maintain air flow, it is not the most efficient use of energy cooling. Liebert and Emerson Network Power’s publication titled “Five Strategies for Cutting Data Center Energy Costs Through Enhanced Cooling Efficiency” has a number of recommendations to increase the cooling efficiency of data centers. For instance, equipment racks should be positioned so that each row faces each other. This will create hot aisles as the racks exhaust hot air and cold aisles as the racks draw in air. CRACs (computer room precision air conditioners), which control the humidity level in a data center, should be placed perpendicular to the hot aisle to stop hot air from entering the cold aisle. Server cables and piping in a data center should also be managed so that it does not obstruct air flow. By using outside air and providing free cooling during cold months of the year, economizers have the ability to cool data centers at a low cost. There are two types: air-side economizers, which use sensors, ducts and dampers to maintain appropriate air flow from the outdoors; and fluid-side economizers, which use a heat rejection system with a glycol solution and an outdoor cooling tower. CRAC units will operate more efficiently with the use of varying capacity based on operating conditions. This is done through 4-step compressor unloading, which shuts off refrigerant to some cylinders rather than cycling the compressors on and off to control capacity and operate more efficiently. Advanced control systems should also be used to ensure that CRAC units in the room communicate and coordinate operation to avoid having some units add humidity and some units remove moisture. In 2002, Emerson Network Power’s Liebert XD System introduced supplemental cooling. This is a system that pumps refrigerant cooling from above or next to high density racks to supplement cool air pumped from the floors. The refrigerant, R134, converts to gas when it hits the air which is 700% more effective in moving heat than water, and ensures no damage to servers in case of a leak. The combination of the refrigerant and ideal location of the cooling system can reduce energy costs up to 27%. There are also a variety of financial incentives that are offered by local utility companies. For example, California’s Pacific Gas & Electric offers a utility rebate program for efficient cooling systems in data centers larger than 5,000 square feet. Through the Data Center Cooling kW for verified savings by QuEST engineering services. Recently, Google recognized the need for “greener” data centers and invested over $10 million in Enhanced Geothermal Systems (EGS). This is similar to the traditional geothermal approach in that it finds pockets of steam or hot water, yet this system fractures hot rock, circulates water through the system, and uses the steam created to produce energy. This approach will be extremely cost-effective if it is scaled to data center power usage. There is also a federal tax credit of 10% available for businesses with geothermal systems (26 USC 48). The location of a data center is the key in determining the efficiency level of hydropower usage. Hydropower is a cost effective and reliable electricity source used data centers. If the facility has easy access to a body of water, the cost of energy transmission is eliminated. Hydropower capital costs and maintenance fees are also relatively low. Another benefit to this alternative energy source is that local utility companies may offer to buyback electricity overflow. The utility company serving Google’s data center, MidAmerican Energy, generates more wind energy than any other utility in the US. Wind is another great renewable source of energy but like hydropower, wind energy is dependent on the location of the data center. An innovative alternative energy source recently featured on CBS’s “60 Minutes” is the fuel cell. Bloom Energy is just one of the providers of fuel cell energy and calls its product the Bloom Box. This is a unit made up of fuel cell stacks; oxygen and fuel are drawn from opposite sides of the unit and together, through a clean electrochemical process, they create power. Water is the only waste generated. An attractive aspect of the Bloom Box is that energy is produced without connection to an electric grid and therefore more reliable. Google, eBay, Staples and Wal-Mart are just some of the large corporations generating power using the Bloom Box. Not only is the Bloom Box energy efficient, but it is also eligible for a 30% federal tax credit (26 USC 48) and in California there is a 20% tax credit. The Fujitsu data center located in Sunnyvale, California reaped $500,000 in utility rebates from fuel cell use and will recover costs in just 3.5 years. Demonstration projects- Projects for an energy efficient data center, server technology, component or system presented at a NY state site. Product development- Projects for an energy efficient data center or server technology that provides economic benefit besides its end use. Technology feasibility- Projects that focus on studies of conceptual design, technology and market assessment or other preliminary product development research. Market development- Projects that are performed through services to the NY state marketplace (educational workshops, seminars, training, etc. on energy efficiency). Advanced Concept Data Center Project- A project that utilizes a combination and integration of energy efficient technologies and practices. Additional rebates can be obtained through negotiation with local utility companies for custom rebates based on the intent of the design. The company must show that the data center’s design promises long-term energy savings to acquire a custom rebate for complex energy-savings measures, as opposed to prescriptive rebates that are based off pre-determined energy efficiency measures. For example, Long Island Power Authority, a utility company also in New York, offers up to $200,000 in custom rebates per building annually. While the size of a data center is similar to that of an office building or factory, it is not similar in employment level. The average data center employs between 50 and 100 IT workers for day-to-day operations, depending on the size of the facility. More employees are needed for the construction of the data center than for the operation of the data center. IT workers may be less in number, but their position demands a higher level of IT and management skills. Iowa Governor, Chet Culver spoke of Google’s data center jobs and stated that it “will attract some of the smartest and most capable people from around the world to our state, and keep our smartest workers here in Iowa.” Managers and employees must understand data center operations and IT architecture (networks, software, data, and applications), and have the ability to adapt quickly to modern processes and technologies. In the current economic environment, companies are looking for ways to reduce costs through automation and as a result turning to virtualization and cloud computing. Virtualization is an alternative to data center storage; through this method, companies can now store information on the internet, as opposed to physically storing data amongst the servers in a data center. The data can be accessed from any computer through an application provider which stores data for a fee based on usage. This is often referred to as “cloud computing.” This was introduced by leading provider Salesforce.com in 1999 in an effort to make enterprise software easier to use and to reduce costs. This service presents a major business advantage in that the cloud can store and secure a large amount of data over the internet, allowing companies to scale back and operate out of a central data center and access the information from any location. As mentioned earlier, HP will cut half of its data centers as a result of virtualization. Cisco also recently announced its plans to consolidate its 56 data centers into 20 data centers over the next six years with cloud computing. The cloud is also a more affordable method of storage, which has enabled many companies, particularly start-ups, to avoid the purchase and maintenance of expensive servers. Leading tech companies provide cloud computing services to businesses. Among these are Amazon’s EC2 (Elastic Cloud Compute), Google’s App Engine, and HP’s Cloud Assure. Amazon uses an Amazon Machine Image (AMI) which is the web service interface that contains the applications, libraries, data and settings custom to the company. Benefits to these services include lower operating costs, increased scalability, accessibility and reliability. Developing a central data center is a highly beneficial decision for many companies operating in the fast-paced technological business environment of today. It ensures a reduction of costs and allows for greater focus on energy efficiency. This can lead to even more savings by qualifying for the wide range of tax incentives available for environmentally-friendly data centers. Five strategies for cutting data center energy costs through enhanced cooling efficiency (2007). Emerson Network Power; Liebert Corporation. Goulding, C., Goulding, T., & Kumar, R. LED parking garage lighting installations accelerate with EPAct tax savings. Corporate Business Taxation Monthly, (Sept. 2009), 15-16, 46. Cassandra Gengler is a Tax Analyst with Energy Tax Savers, Inc.